Pictures sent in (February 2018) by Chris Burns from Spanaway, Washington of his 2000 Pacific CX drums. Way to go Chris! Thank you so much jamminsam for your amazing service, my drum turned out amazing and the matching process was educating and a joy. In the picture of (the) full kit, smallest tom closest to camera is in your wrap and the remaining kit is a year 2000 Pacific CX in “White Onyx” and well weathered. 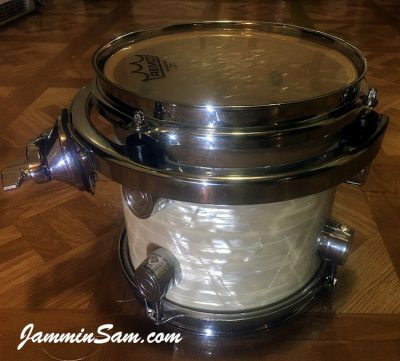 (Your) non-aged 60’s White Pearl matched my non-weathered snare originally from this kit but unised. 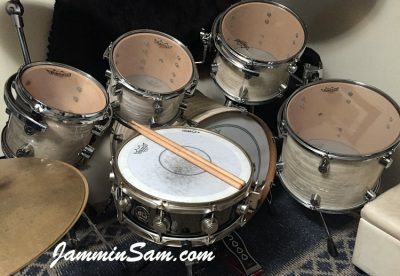 The remaining parts of my kit are well aged and the Aged 60s White Pearl was a PERFECT match.